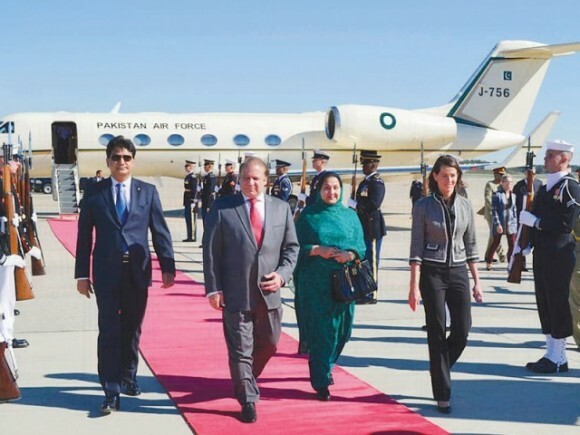 Prime Minister Nawaz Sharif and his key civilian advisers received the red-carpet treatment in Washington last week. The Prime Minister’s state visit — the first official trip of a Pakistani leader in a decade – including meetings with President Obama, Vice President Biden, Secretary Kerry, Defense Secretary Hagel, NSC Adviser Rice and CIA Director Brennan. Talking points were exchanged primarily on Afghanistan, counter-terrorism, drones, regional security, and Pakistan’s economic and energy woes. Missing from the conversation – at least according to press reports – was the topic of nuclear weapons. Chalk this up to yet another negative consequence of seemingly endless warfare in Afghanistan. President Obama and Prime Minister Sharif emphasized that nuclear terrorism is one of the most challenging threats to international security. President Obama appreciated Pakistan’s constructive engagement with the Nuclear Security Summit process and its cooperation with the International Atomic Energy Agency and other international forums, while acknowledging Pakistan’s efforts to improve its strategic trade controls and enhance its engagement with multilateral export regimes. Looking ahead to the 2014 Nuclear Security Summit at the Hague, the two Leaders reaffirmed the commitments of the 2012 Nuclear Security Summit in Seoul, strengthening nuclear security; reducing the threat of nuclear terrorism; preventing terrorists, criminals, or other unauthorized actors from acquiring nuclear materials; and working closely for the objectives of the Summit. They acknowledged the importance of regional balance and stability in South Asia and pursuing increased transparency and uninterrupted dialogue in support of peaceful resolutions of all outstanding issues. Prime Minister Sharif affirmed Pakistan’s support for the universal objectives of non-proliferation and disarmament. The two Leaders underscored that all sides should continuously act with maximum restraint and work jointly toward strengthening strategic stability in South Asia. Prime Minister Sharif expressed Pakistan’s desire to join the multilateral export regimes. President Obama reiterated his confidence in Pakistan’s commitment and dedication to nuclear security and recognized that Pakistan is fully engaged with the international community on nuclear safety and security issues. The Nuclear Security Summit as headliner? Here are some words missing from the Joint Statement: Pakistan’s growing stockpiles of nuclear weapons and fissile materials; short-range, tactical or battlefield (take your pick) weapons; Comprehensive Test Ban Treaty; Fissile Material Cutoff Treaty; moratorium on nuclear testing; nuclear competition and nuclear risk reduction. These missing words suggest several possibilities. The Obama administration is entirely cognizant of the challenges facing Nawaz Sharif. Washington wants him to succeed, and there are already enough high-profile areas of disagreement, starting with drones, the Afghan Taliban, and Pakistan’s disinclination to prosecute Hafiz Saeed and others for killing and injuring hundreds of innocent people in Mumbai in November 2008. Neuralgic issues are best discussed in private. Since the United States and Pakistan have different perspectives on nuclear-related issues, why air them in public? All true. But there’s a larger, more uncomfortable truth, as well: Washington’s plate of issues with Pakistan is so full, starting with Afghanistan, there’s hardly any room left for talking points on nuclear issues. Two chapters of the war in Afghanistan – especially after the Soviet invasion in December 1979 and following the 9/11 attacks – have effectively insulated Rawalpindi’s nuclear programs from US talking points. This continues to be the case as US equipment exits Afghanistan the same way it came in, and as iffy diplomatic efforts are underway in pursuit of an Afghan political settlement. To be sure, talking points are a mild form of pressure. And far more serious instruments of suasion, like withholding military assistance, will only reinforce Pakistan’s mistaken nuclear trajectory. Nevertheless, nothing good can come from the Obama administration’s muteness in the face of an increasingly dangerous nuclear competition on the subcontinent. Pakistan is competing far above its weight in this competition. Trend lines on the subcontinent are very negative. Warhead stockpiles and fissile material production capabilities are increasing significantly. Pakistan and India now each possess more types of nuclear weapon delivery vehicles than the United States, and platforms will diversify even further with families of cruise missiles and launch capabilities at sea. Conventional military doctrines have evolved to fine-tune limited-war scenarios. Pakistan’s nuclear doctrine stresses first use, while New Delhi stresses massive retaliation. Rawalpindi has declared a military requirement for very short-range, nuclear-capable ballistic missiles; other types of battlefield nuclear weapons might well follow. Every other state that has embraced tactical nuclear weapons has not been able to figure out how to make sense of their use in operational terms. New Delhi faces the choice of whether to go over the top of short-range systems with air sorties and precision strike, stand-off weapons – hard to do in an Army-centric military culture — or to respond in kind. The dynamism of nuclear weapon-related developments on the subcontinent contrasts markedly with somnambulant diplomacy to reduce nuclear dangers. New Delhi and Islamabad have not conducted regular, substantive, high-level, purpose-driven talks to normalize ties for five long years – ever since the 2008 Mumbai attacks. One measure of responsible nuclear stewardship is negotiating agreements seeking to stabilize deterrence and reinforce escalation control. The last such accord between Pakistan and India – the Agreement On Reducing The Risk From Accidents Relating To Nuclear Weapons – was signed in February 2007. The mismatch between growing nuclear dangers and stagnant diplomacy is growing on the subcontinent. The Obama administration’s silence doesn’t help. I recognize that the couple in the middle are the Sharifs. Can anybody identify the individuals flanking them? Even when we limit our concern strictly to Pakistan’s national security interest, Pakistan needs neither terrorists nor nuclear weapons, both of which detract from Pakistan’s security. The alleged threat from India is insufficient to justify either, and mainly justifies the military’s claim to rule over Pakistan, rather than let the Pakistani people rule themselves. The U.S. interest should be to support the civilian government as much as possible, including an increased emphasis on trade, economic development, and detente with India. With or without the Afghan issues, it is doubtful that it makes sense for the U.S. to publicly point out all its disagreements with Pakistan, rather than emphasize various points of commonality. – is simply because it is the British and the Americans, Pakistan’s closest allies and mentors, that have encouraged Pakistan for at least a four decades, seeking parity with India. Feeding Pakistan’s ambitions of seeking parity with India continues even today, albeit in a subtle way. If Pakistan could moderate its population growth and get more of its students into the equivalent of IIT’s (stronger secular/technology education), I think it could be very successful economically, i.e. punching its weight. It has 180 million friendly and industrious people. It has good natural resources, particularly arable land. In the long run, there should be the equivalent of the European Union between Pakistan, India, and Bangladesh; with Kashmir being the equivalent of Andorra or Lichtenstein; i.e. some country that exists in name but is really for all economic purposes part of the Subcontinental Economic Union. As an American, I do not understand why India and Pakistan cannot move beyond their historic differences towards an economic union. It is a waste. Michael everyone is entitled to his or her views and your commitment to non-proliferation though far above Pakistan’s ‘sins’ is well known but deliberate use of expressions such as “Rawalpindi’s Nuclear programs” is mischievous to say the least and totally unfair. Does US have any face to lecture other countries on ‘CTBT’? By the way Pakistan did not initiate either of the two wars in Afghanistan – the first was fought to settle scores with the Soviets and the second to settle scores with Al-Qarda / Taliban combine. As for Jonah Speaks I wonder how have you assumed the divine right to decide on what Pakistan needs or doesn’t need for its security. I wonder how would you justify India’s nuclear program as a legitimate response to the so called ‘Chinese threat’ if you are not willing to grant the same to Pakistan. Brigadier Naeem, by the same logic, why has the military assumed the divine right to decide what Pakistan needs or doesn’t need for its security ? Its a fact that the military dominates when it comes to nuclear policy making and civilians have relatively little input in formulating the policy. Before the FMCT discussions in Geneva, the American representatives from the US embassy in Islamabad head straight to ACDA SPD and talk to Air Commodore (retd.) Khalid Binuri and Adil Sultan (also from PAF) and don’t even bother to nudge the Arms Control section of the foreign office.Military has ruled the country for over 30 years and still we have retired soldiers turned academics like you trying to convince the west that using ‘Rawalpindi’ is blowing out of proportion. My views are based on a rational, independent analysis of Pakistan’s circumstances. These views are neither anti-Pakistan, nor pro-India. Rational argument: Kashmir is the main dispute between India and Pakistan. This dispute cannot rationally justify a nuclear war with India. Moreover, there exists no combination of terror, conventional fighting, or nuclear threats that can force India to give in on Kashmir. Nuclear weapons are useless for Pakistan. Even worse, nuclear weapons cost considerable expense and pose great danger to Pakistan. A nuclear-armed Pakistan is in grave danger of nuclear war with India. If Pakistan lacked nuclear weapons, there is essentially zero chance that India would nuclear bomb Pakistan. These weapons confer great danger and cost to Pakistan, while providing no benefit. The mere fact that India has nuclear weapons does not change the national security logic that these weapons are bad for Pakistan. Do Canada, Cuba, Mexico, and Venezuela need nukes because the U.S. has them? Do Germany, Italy, and Spain need nukes because Britain, France, and Russia have them? Do Japan, South Korea, Taiwan, and Vietnam need nukes because China has them? The rest of the world says NO. By involving in a massive nuclear arms race, I think, both India and Pakistan are adding all ingredients to the recipe that might prove disastrous in South Asia. Between two players, there is always some bench-mark, there is always some end-point, there are always some rules of the game. It seems that both the South Asian players playing the “nuclear game” as if it is endless — largely ignoring cost-benefit aspects. Perhaps, they will only learn some lessons from Cold War model after some very bitter experience. May be after a conventional war. Mr Whatever Niazi please don’t comment if you don’t have the courage to even give your name and identification. People with pseudonyms and fake identities have no right to make any comments on any blog. I don’t want to respond to comments by a nameless and faceless ghost writer. My comment was never intended to get your response Brigadier Sahab. Just wanted to let you know that even many ordinary citizens in Pakistan like me (who are increasingly taking more and more interest in these matters) really don’t buy the narrative sold by hawks like you. Cheers ! Who appointed you the arbiter of who has the “right” to comment here, or elsewhere? An identity established by a pseudonym is just as real as one established by a birth name. Reputation is accumulated under a pseudonym just as it is under other identities. It behooves you to engage with the argument, not the individual making the argument. @Jonah Speaks. Your arguments are out of context. Canada and Mexico don’t have need for nuclear weapons because they do not have hostile relationship with the US. In fact, Canada is under the protection of US nukes as a NATO member. Similarly, Germany, Spain etc don’t need nuclear weapons because US weapons are deployed on their soils as part of the extended deterrence and Britain and France are their allies not hostile powers. Just try lifting the nuclear umbrella from Japan and see how quickly it will acquire nukes of its own. By the way why does the strongest conventional military power on earth needs nuclear weapons whereas it can militarily defeat any other power in the world with its conventional arms. It is good to lecture others – please match your sermon with action and set the example for others to follow by disarming your country of nuclear weapons. We will immediately follow your footsteps. You are quite right; “Rational” so he is sane and we are all mad – specially those of us in Iran who have been invaded 3 times in the last 100 years, and have been subject to economic warfare by US and UK twice in the last 60 years. Yes, we are Mad and Anglo-Americans are sane. NAEEM, You mistake a rational argument about Pakistan’s self-interest for a sermon. Your counter-argument does not address the main points I made about costs and benefits for Pakistan. Only some of the world’s nuclear weapons states can safely disarm unilaterally. Pakistan is currently one of those states, along with Britain, France, and North Korea. Possibly India and Israel are also in that category. The rest must nuclear disarm carefully, by mutual agreement. If Pakistan believes in nuclear umbrella, it can request nuclear umbrella from U.S., China, or whomever. In any case, Pakistan is safer without nuclear weapons than with nuclear weapons. Of late, criticizing Pakistan out of context and without accounting for the ground realities appears to have become the norm. Nuclear weapons have preserved the peace in South Asia and prevented the outbreak of full-scale conventional war several times, a fact attested by Indians themselves. Nuclear weapons are a fact of life in the region and aren’t going away anywhere for the foreseeable future. However, some nations and individuals are professing their divine right to develop and acquire nuclear technology, both for civil and military purposes, while proscribing the same for other “lesser” nations, without ever bothering to understand or appreciate their legitimate security concerns. Both India and Pakistan possess less than 1 % of the world’s nuclear arsenal. By any stretch of imagination, it is obligatory for the NPT signatory weapon states to fulfill their treaty obligations of nuclear disarmament first and then ask others to follow suit. Also, the message that is being spread around is that nuclear technology for energy and defense is “allowed” and encouraged for India, which can do anything it wants as a NNW state to expand its fissile material stocks, retain large stocks outside safeguards, and continue to build SSBNs, SLBMs, MIRVs, BMD/CMD, and ICBMs while enjoying all the benefits of a NW NPT signatory state without having any obligations as a state party to the treaty. At the same time, Pakistan must not complain, or even attempt to take defensive measures (according to its own resources and force goals) to counter the threats it perceives from the permanent deployment of 3/4th assets of the world’s 4th largest conventional military machine on its Eastern border. Nor is Pakistan entitled to seek civil nuclear energy from any supplier state while it is the world’s duty to help India develop a large nuclear energy program. If non-proliferation is such a cherished goal, why was the CTBT and the FMCT not linked to the Indo-US nuclear deal and the India-specific NSG waiver? Why was India allowed to keep a large part of its fuel cycle outside safeguards if FMCT is such a cherished goal for South Asia? So it seems that the FMCT is a Pakistan-specific treaty. If not, then ask India to sign and ratify it and see the response. Pakistan was not the first country to initiate nuclearization in the region. It called for the setting up of a Nuclear Weapon Free Zone in 1972 and again after India’s 1974 test. It sought negative security assurances from the world powers after Pokhran-I and no one came to its help. In 1998, it had to respond to India’s nuclear challenge to restore the balance of power and contain belligerent rhetoric and threats from BJP leaders to attack Pakistan. Now that it has succeeded to build an effective deterrent, and is consolidating its plutonium production capabilities in the face of a huge asymmetries with India, it is being asked to stop producing fissile material and not to diversify its delivery systems when India is actively pursuing BMD capabilities and a large nuclear triad. Each nation has its own sovereign right to develop the means to defend itself. The application of double standards, discriminatory policies and seeking haves and haves not in favor of one country at the expense of the other will only serve to convince the hawks that the country is being pushed against the wall. If that is the case, then there can be no constructive engagement in nonproliferation approaches, and no unilateral restraint or escalation control in case a crisis gets out of hand. P.S. I am also a civilian. While I do agree with some of your points here, there are two points that I want to make. Preserved peace ? Only when it was disturbed by Pakistan (e.g . in Kargil) ? 2 – Please mention Pakistan’s proliferation record in parallel when mentioning West’s double standards. An academic must present all existing narratives before making a conclusion. Otherwise its a biased conclusion. Cheers ! It would be useful to get the facts right before anything else. Nuclear Deterrence worked in 2002 and 2008. Even a bomb in the basement capability stopped India and Pakistan from going to war during the 1986 and 1990 crises. As for Kargil, it was under Pakistani control prior to the 1971 war. It was LIC and was a demonstration of the stability-instability paradox in 1999. If Pakistan is accused of initiating hostilities in Kargil in 1999, India is planning to do a similar thing now through Cold Start. The only difference is that India plans to do it across the International Border while Pakistan did that along the Line of Control (ceasefire line) whose so-called sanctity has been breached several times by both countries. If Pakistan initiated Kargil conflict, India had carried out similar incursions on the Pakistani side across the Line of Control in Kashmir in 1984 at Siachen, and at other places on the LoC (Chorbat La: 1972, Qamar sector:1988 etc). Illicit and private nuclear proliferation was never authorized by the Pakistani state as a matter of policy. The Indians have some questions to answer with regard to them being one of the suspected beneficiaries (fourth customer) of centrifuge technology. So does the west, since many in the proliferation network turned out to be working for the CIA, which according to the former Dutch Prime Minister Rudd Lubbers prevented Khan’s arrest in Europe on two occasions. If it was state policy in Pakistan to proliferate, why proliferate a few dozen used centrifuges and bellows only? If it was ever a state policy to proliferate (which it never was), why only one technology (centrifuge) was being put on sale by one individual and why not other elements of the fuel cycle or the complete bomb itself (whose development was outside his mandate and control) under a state to state arrangement (which never happened)? The Iranians (eg. Ali Akbar Velayati) are on record of having said that they were dealing with him privately without the knowledge or consent of the Pakistani government. 1 – It would be unwise to look at one side of the picture. The reason crises escalated to the point where our eastern neighbour thought of using conventional force was because Pakistan under the umbrella of its nuclear weapons was letting these militants use its territory to carry out attacks across the border. My point being: The possession of nuclear weapons has rather given us space to use asymmetric warfare and keep the region in continuous turmoil. It encouraged adventurism as was witnessed during Kargil so I am really not sure what ‘restoration of peace’ you are talking about. Its rather the other way round. Except during the operation brasstacks every time nuclear deterrence came into play was after Pakistani (state or non-state) actors got involved in activities across the border. 2 – One must avoid rationalizing Kargil. The Pakistani intrusion proved disastrous for country’s image around the globe and was a military blunder (acknowledged by military commanders themselves). It was a military adventure which had detrimental strategic implications for the country and The forces eventually had to withdraw after suffering heavy casualties and apart from capturing point 5353 (apparently) there wasn’t anything that Pakistan could gain out of it. 3 – The seeds for Cold Start were sown by Pakistan itself when it tried to create space for conventional conflict in a nuclear environment (again, during Kargil). Moreover, while referring to Cold Start, one must also recognize that Cold Start is a consequence of asymmetric warfare. Even if latter is the case, the state of Pakistan is still to be blamed. Michael thanks for generating a very interesting debate indeed. You mentioned Indian nuclear doctrine is that of NFU and ‘massive retaliation’. So in your view how do Prahaar which is a short range ballistic missile employed by Indian artillery explain this role? According to the DRDO press Release this missile system has been developed after extensive research of 2 years, predating Pakistani test of NASR and it has been developed to provide Indian Army a cost effective, quick reaction, all weather, all terrain, high accurate battle field support tactical system. Prahaar is capable of carrying only conventional warhead. (given that its a modified version of India’s Anti Ballistic Missile). It doesn’t even fit in the ‘massive retaliation’ response. Designed to just fill in the gap of Pinaka rockets (with range up to 45 km) and Prithvi variants (starting from 250 km). I believe that it doesn’t change anything vis a vis Cold Start and is definitely not an answer to Pakistani battlefield nuke Nasr. Its part of their conventional response ONLY. I don’t think it is worth wasting time in debating any issue on this blog because regular contributors seem to be so obsessed with their ethno-centric biases that they want to impose their own views and are not prepared to accept a different perspective. The problems is that people like Jonah don’t even know the history well otherwise he would not have suggested Pakistan requesting a nuclear umbrella – Pakistan did exactly that when India conducted its first nuclear test in 1974 but no major power was willing to make that commitment. In any case Pakistan like any other state has a right to assess its security environment and take suitable measures to address threats to its security. Please leave Pakistan alone for a while and we will be much better off than we are today. Meanwhile you should focus your attention to resolving, the sequestration, government shut down, burgeoning debt and poorly performing economy of yours. A break in snooping over Pakistan will also save you some billions of dollars every year. “Leaving Pakistan” alone would not do; else where would these erstwhile indispensable people go to play at exceptional-istic geopolitics? If Pakistan did not exist, they would have to invent it just for that purpose. At any rate, their singular and most recent contribution to the people of Pakistan has been their scuttling of the Peace Pipeline. Bravo ye Exceptional People for condemning Pakistanis to enduring the misery of 50 degree temperature. This blog permits many to express their views; none are “imposed”. Since I am neither Indian nor Pakistani, ethnocentrism does not bias me for or against Pakistan. Since Pakistan waited no more than 17 days to conduct its own tests (May 11 vs. May 28), I do not think it can be seriously said that Pakistan conducted extensive or persistent diplomacy to obtain a nuclear security protection guarantee from any nuclear power. Pakistan’s covert nuclear program had been active for decades. What Pakistan really wanted in 1998 was a Bomb, not an umbrella. I would recommend that you read “Eating Grass: Making of the Pakistani Bomb” by Brigadier Feroz Khan.It might help you in understanding the Pakistani view of history in the region. A must read. Below is the link of a very insightful op-ed by one of leading and most respected social scientist of Pakistan Dr. Muhammad Waseem. One cannot discuss nuclear issues and Pakistan without a holistic picture of internal dynamics of the country. In earlier comment link was wrong so please neglect that one. Americans cannot understand other people and think of themselves as clever and sophisticated; but they could be manipulated by the foreigners – as they are now being manipulated by Israelis and Arabs of the Persian Gulf. Before that, the Nationalist Chinese pressed the right buttons on the US body-politic and delayed US recognition of the People’s Republic for almost 2 generations. i guess you did not read the complete comments by mansoor and naeem. Pakistan asked for nuclear umbrella after 1974 – Pokhran-I – and waited for about 28 years till may 11 1998. If the world did not agree to extending deterrence in 28 years, would they do that after 1998? Mr Jonah with due respect my earlier point about lack of familiarity with South Asian history stands vindicated by your latest comment. My dear sir, Pakistan did not seek nuclear umbrella from anyone not even China after 1998 Indian tests but it did send its Minister of State for Foreign Affairs Aziz Ahmad to Washington, London, Paris and Beijing to seek a nuclear umbrella failing which Pakistan decided to pursue its own nuclear effort. In any case, that is a matter of past, nuclear weapons are there to stay in South Asia and no amount of pious sentiments can wish them away. Unfortunate but a reality and as Mansoor rightly pointed out Pakistan did not start the nuclear competition in South Asia. As for Mr/Mrs/Miss Niazi, I am not sure whether you are Narinder Singh or Nihal Chand but I have no doubt that you are an Indian and I am beginning to have a fair idea of you identity now. Your arguments have a context now. So if I don’t agree with you, I am an Indian ?. Thats quite a criteria. Its rather unfortunate that instead of responding to/engaging with the rationale behind my arguments, you are more concerned about my identity. I was unable to obtain information about any follow-up diplomacy by Aziz Ahmed, how extensive it may have been, or what the response was. I would also add, there was no attempt by India to “nuclear blackmail” Pakistan at any time since 1974. Nuclear blackmail is also precluded by India’s no-first-use policy. If Pakistan ever did want a nuclear umbrella from other nuclear states, 1998 would have been the best year to try to obtain one. I would agree with you that the past cannot be changed, but the future is still unwritten. Pakistan still has choices to make. In 1998, many observers simply assumed that Pakistan and India would simply deter each other: No nuclear war, no conventional war, nothing more to worry about. Events since 1998 place serious doubt on this idea of mutual deterrence. In particular, the past 15 years has seen three provocations of India from the Pakistani side. This is sometimes referred to as “sub-conventional warfare” (e.g., terrorist attacks or military units in civilian clothes). The standard analysis suggests that Pakistan is using the threat of nuclear war to deter conventional retaliation from India in response to Pakistan’s various sub-conventional provocations. This is very risky business, given the potential for nuclear escalation. It is this very significant risk taking that leads me to the conclusion that nuclear weapons have been bad for Pakistan: All cost, significant risk of catastrophe, and no benefit. Even if you cannot bear the thought of Pakistan giving up its nuclear weapons, please do everything you can to stop all this risk taking by Pakistan. @admin y dint u publish my other post? there was no abusive language or anything like that. so how does India claim that it is going to replace Prithvi with more capable Prahar? please dont tell us here that India is going to replace a nuclear capable missile with one that carries conventional payload. is this how you do with something that is acquired under MTCR guidelines? I hesitated to post your comment because there is no evidence of a nuclear warhead for Prahaar that I am aware of — just the usual braggadocio coming out of DRDO. It is, as you say, nuclear capable, but Pakistani spokespersons are in no position, as yet, to spread the blame for the Nasr. Niazi. You have actually raised an important and interesting point. If Prahaar is a ballistic missile, tipped only with a conventional warhead then whats the logic and purpose of developing a more costly conventionally armed weapon system, which Prithvi or even Brahmos cannot achieve. In addition, are you saying that ‘ballistic missiles’ even if conventionally armed will be under delegative control of the Indian Army instead of strategic forces? Moreover, what will India the confidence that any ballistic missile, when being prepared for launch will not be perceived to be a preparation of a pre-emptive nuclear strike by India, leading to Pakistan’s inclination to use or lose its own Nasr, which you know ‘could’ be nuclear armed. Lastly, how does massive response doctrine reconcile with the battlefield deployment of ballistic missiles under the delegative control of Indian Army commanders, who will ensure that its for no first use only. Best, Syed Muhammad Ali. had a similar statement been there about any of Pakistani missile by a strat organization would you still consider that any less credible? why such a soft corner for India? I call ’em as I see ’em, and have therefore been in and out of favor in both Pakistan and India. This is an occupational hazard of working at an independent-minded think tank and being in no-one’s pocket. DRDO succeeds in some areas, and performs badly in others. It also suffers from making exaggerated claims without follow up. At times, DRDO leaders appear to be playing the role of lobbyists — seeking to prompt government concurrence that is missing behind closed doors. Many in Pakistan take these claims as gospel which, in turn, ratchets up Pakistan’s nuclear requirements. It’s OK to blame the Nasr on “Cold Start.” But for purposes of completeness, I agree with Niazi that one would also be advised to blame “Cold Start” on Kargil, the attacks on the Indian Parliament, Mumbai, etc. It’s not OK (at least not yet) to blame the Prahaar for the Nasr. I agree with Naeem that ACW readers interested in the history and rationale of Pakistan’s nuclear program would be well advised to read Feroz Khan’s book, Eating Grass. ( Hassan Askari Rizvi, ‘Pakistan’s Nuclear Testing’, Asian Survey, 41, 6, 2001, p. 943-55.). I have provided the reference for cross checking and saving you the trouble of consulting encyclopaedias. I believe if you look into US government archives you will find records of Aziz Ahmed’s conversations with the US officials once he visited Washington after the Indian test. Just to remind you that Pakistan had introduced a resolution in the UN General Assembly in 1974 to declare South Asia as a NWFZ. I am sure no encyclopaedia would be needed to confirm that as the resolution is available in the UN records. @ MK; Why should Pakistan be spreading blame for NASR, it decided to develop the weapon system considering it necessary for its nuclear deterrence. It is nice to see PRAHAAR being made kosher by terming the DRDO statement about PARAHAAR’s capability as DRDO ‘braggadocio’, one would hope such consideration would be given to AQ Khan’s or any other Pakistani officials ‘braggdacio’. NAEEM SALIK, Thank you for the additional references. These two references discuss reasons why Pakistan tested its nuclear weapons in 1998 immediately after India’s weapon tests. In my view, Pakistan would have been better off delaying its own tests while exploring other options. These other options could have included seeking a lifting of its own sanctions, more vigorous prosecution of sanctions on India, negotiating a “nuclear umbrella” from nuclear weapons states, and otherwise dissuading India from pursuing an actual nuclear weapons program. If these alternatives failed to work, Pakistan still could have tested its own bombs six months or six years later. India’s decision to test nuclear weapons in 1998 was a major national security blunder. It was foreseeable that Pakistan would likely test its own weapons in response, and that a nuclear arms race would ensue. The only way this could be rational for India is if India could somehow persuade or dissuade Pakistan from following suit. Instead, Indian officials goaded Pakistan with aggressive, macho-type talk about what India might do to Pakistan. Pakistan should not have taken the bait, but it was rather predictable that they would. India must now live with the risk that major cities in India could be destroyed in a future war with Pakistan. I see no further clues on what happened to Pakistan’s 1974 proposal for a nuclear umbrella, so I leave it to others to research diplomatic archives, old newspapers, or other sources of information. Absent further information, my best guess is that the nuclear umbrella idea was premature, until 1998 when India finally instituted an actual nuclear weapons program. I am glad that Pakistan was willing to accept a South Asian nuclear-weapons-free zone (NWFZ) as a suitable alternative. Until 1998, Pakistan enjoyed with India a de facto NWFZ, even though it was never cemented by treaty. That period ended because India chased after illusions, and Pakistan forgot what its interests were. Perhaps if both sides can see the errors in the past, they can work together to heal the future. Michael, you are right Prahaar cannot be blamed on Nasr. That is my point exactly because according to DRDO’s official statement, its development pre-dates the testing of Nasr. My question is basic – why would a nuclear power develop an expensive delivery system like a ballistic missile and tip it with conventional warhead, employ it for tactial use on the battlefield when its air force already has tested and proven PGMs like AS-30L and accurate cruise missiles like Brahmos, when it already has significant quantitative superiority in terms of conventional forces and also claim to have a massive retaliation and NFU doctrine? Does it means that the Indian field commander neither trusts his own conventional superiority nor the massive retaliation doctrine posture of his government because it couldl fail in preventing 1st use by the adversary. Moreover, even if one is to believe that Prahaar is convetionally armed, a commander on the other side in a crisis situation might find your assurance less convincing than the DRDO’s official statement and is very likely to take it out well before he takes out the accompanying T-90s and Arjuns in the initial phases of conflict rather that to wait to be on its receiving end later on. Lets hope and pray that nuclear weapons help prevent war in South Asia rather than make it more likely through doctrines like Cold Start, which let me assure you and our neighbours, could lead to very ‘hot end’ at both conentional and Strategic levels. War is not an option after nuclear deterrence and thats what we want to learn from the cold war’s experience not the contrary. Best wishes. Why do Pakistan and India each have, at present, more types of nuclear weapon delivery vehicles than the United States? The answer to my question is probably the same as for your question about why New Delhi would opt for a conventionally-armed Prahaar. Which could become a nuclear-armed Prahaar. Every state that possesses nuclear weapons has powerful domestic constituencies that want more capability and larger numbers, and can point to an adversary for doing so. Look at the numbers of weapons that the Soviet Union and the United States produced. This was mindless — and yet it happened. Pakistan and India won’t go anywhere near these lengths, but your ongoing nuclear competition reflects familiar Cold War dynamics, albeit on a smaller scale. Since Pakistan has significant economic difficulties, and since India has far greater resources to compete, you have harder decisions to make. How many nuclear weapons will it take to deter India? What types of delivery vehicles are best suited to deterrence? Are short-range nuclear weapon delivery systems a net gain for deterrence? How can the Pakistan Army operate on a nuclear battlefield? I completely agree with you that war — regardless of type and scale — makes no sense on the subcontinent. Since the most likely pathway to war begins with mass casualty attacks on Indian soil by individuals who are trained and based in Pakistan, the essence of war prevention begins with concerted efforts directed against groups that have been responsible for such attacks in the past. @Michael, I never suggested reading of ‘Eating Grass’ it was recommended by Mr ‘Kanwal Niazi’, If I had to suggest any book I could well have suggested mine. Nobody wants anyone in the pocket neither do we want to see anyone trying to pocket us. But please don’t make us believe that PARAHAAR would be carrying ‘Tylenol’ warheads to relieve Pakistanis of any pain. At the moment Pakistan is under the microscope while India’s development of ICBM range missiles are being taken lightly because they can only hit Chinese targets as yet but I am waiting to see the reactions when they start reaching the American mainland as has long been advocated by one of the former Stimson fellows from India. Perhaps we should ignore his utterings also as inconsequential like the DRDO bosses.